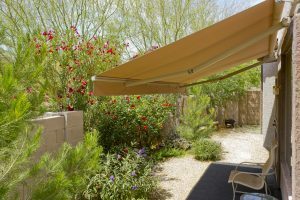 Retractable awnings are a great option for your home. Read more to find out why! You have finally decided to invest in an awning for your home. This is a great option because it provides you with protection from the sun and a great, shaded area to enjoy the outdoors regardless of the weather. Now that you’ve decided on an awning, you must decide on which type you will get. Retractable awnings cost a little bit more than your average fabric awning, but they are definitely worth the money. Here are three benefits of a retractable awning for your home. In the summertime, the air conditioning can really increase your energy bills. With a retractable awning, you are protecting not only that one area from the UV rays, but the inside of your home as well. The awning keeps those harsh rays from directly entering your home, which keeps your home cooler. This will allow you to turn that air conditioning down and save a few dollars on those expensive energy bills. Unlike regular awnings, all you have to do is press a button to put a retractable awning away for the winter or for any harsh weather conditions. If you want to take a fabric awning down for the winter time, you have to do it manually and then you also have to install it when the weather breaks again. When the weather gets bad, all you have to do is either crank the arm of the awning to roll it up or push a button to retract your awning (if you choose an electric one) and you don’t have to worry about the wind or rain causing any damage to it. With a retractable awning on your patio, you no longer have to be chased inside because the sun is too hot or a little bit of rain is falling. You can enjoy your patio despite the weather because your awning will provide your protection from the elements. Even is the sun is blaring down, your shaded patio will be nice and cool so you can still enjoy those nice, summer days. You can watch the relaxing rainfall from the comfort of your porch without the worry of getting drenched. Ready to get the perfect awning for your apartment building, business, or home? Carroll Awning Company has the expertise and equipment to make and install the perfect residential or commercial awning to give your home or business an even cooler exterior. We can design, create, and install custom canopies and awnings all year long. For a free estimate and to get started designing your dream awning, give us a call at 1-800-999-5617 or visit us online. To see examples of our work, follow us on Facebook, Twitter,Google+, and LinkedIn.